When I was planning my wedding, I happened to be alone with the caterer to make the final selections on the food, etc. Bill and I had, of course, discussed everything, we thought, in advance. But somehow I was unclear what his wishes were for the cake flavor (the design we discussed, but not the flavor). At the time, I didn’t know much about cakes, and looked at the list of at least a dozen different combinations. I finally settled on one that included Grand Marnier as an ingredient. I don’t think I really knew what Grand Marnier was, but it sounded really grown-up. “Unusual selection,” said the woman. “Uh-oh,” I thought. I, myself, am an “unusual selection” sort of person. My husband is definitely not. My husband is a “traditional selection” sort of person. But I went with it anyway, and hoped for the best. Fast forward a dozen years, and I find a recipe in The Fannie Farmer Baking Book for a wedding cake that includes Grand Marnier. (If you do not own this baking book, I highly recommend it. It is to baking what Joy of Cooking is to cooking.) I resolved to make this cake for the next special occasion to see if it was anything like my wedding cake. 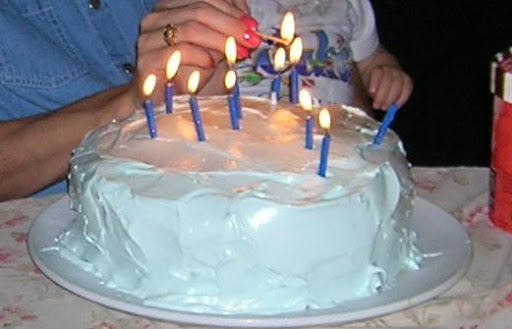 But every special occasion (baby’s baptism, baby’s first birthday, child’s First Holy Communion) came at times that were stressful enough to not need to add elaborate cake baking to the mix. I am not a fabulous baker, especially not of cakes and pies (cookies, no problem). So when push came to shove, I just went with a box mix. Fast forward again to last April and planning for Katie’s First Holy Communion. My friend, who came for birthday dinner last weekend (see Real Food: Part I), decided to join the celebration of her daughter’s First Holy Communion with mine. In divvying up responsibilities, she said she would make the cake. I told her about The Recipe and how I had wanted to make it for baptisms and how I wanted to make it for First Birthdays and how I wanted to make it for First Holy Communions. She didn’t get that I had wanted to, but that I, in fact, had not. She agreed to make the special cake. “What?! ?” she spluttered. “I thought this was The Reitemeyer Family Traditional Cake used for your wedding and all special occasions!” I laughed, cleared up the misunderstanding, and assured her any substitutions she felt necessary would be acceptable. The next day we all told her that it tasted exactly like The Reitemeyer Family Traditional Cake. Her cake was delicious, and she had used the recipe for the batter. 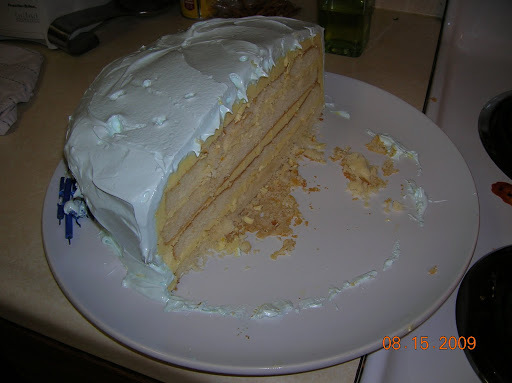 But she did not: split the layers in half, sprinkle one side with Grand Marnier and the other side with orange flower water, or use the orange butter cream filling suggested. It really is an elaborate recipe. Fast forward to last week when my friend and I decided to celebrate her birthday here. “What kind of cake would you like?” I asked her. “I want The Reitemeyer Family Traditional Cake,” she teased. Well, okay then. I even went online and ordered orange flower water since I am 100% sure that the local grocery stores would carry no such thing. 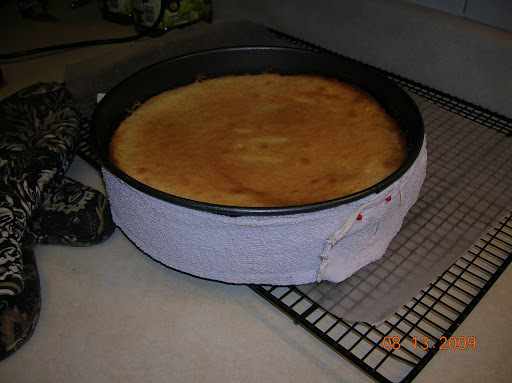 I wrapped the batter filled pans with wet toweling to keep them flat when they bake. This is an excellent trick, and I’ve saved that old cut up dish towel to do this whenever I bake a cake. I split the baked layers in half and sprinkled them. I made the orange butter cream frosting and filled the layers. I did substitute White Mountain Frosting for the Seven Minute Frosting because I don’t have a hand mixer (you’ll have to get the book if you want the recipes). The result: interesting. Did I mention I’m not a fabulous cake baker? It’s a good thing I have many years to practice baking before any of my children get married and ask for The Traditional Cake. I will try this recipe again. The flavor was quite good, and very sophisticated. Very grown-up. Definitely a special occasion flavor. I liked the Grand Marnier. The orange water is very distinctive, very noticeable. It was okay. I’d like to try it without to see if I prefer that more. The biggest change I need to make is in the butter cream frosting. I made the entire recipe which is designed to fill a wedding cake three times the size. I really like butter cream frosting, but it is one of those things where more is not better. The filling was way too thick and made the cake too too buttery. It was like eating a stick of butter with a little cake on the side. Some people like that, but I don’t. I would also like to try the Seven Minute Frosting to see if it tastes much different. Lastly, I much prefer lemon to orange flavor, so I would try it with the lemon flavored butter cream frosting, omitting the Grand Marnier (which is orange flavored). The cake batter yields a dense, moist cake which is well suited to other fillings (my friend used jam for the First Holy Communion party). So there is my long cake story. By the time I am a grandmother, I plan to be a skilled baker. They will never believe all these years of trial and much error. I really like the book “Cake Doctor” (or something like that). The recipes all use a boxed cake mix and doctor it up to make something fabulous. I grew up with Fanny Farmer. My mom had the cookbook. I need to get a copy for myself, because, it remember correctly, it has the best molasses cookie and ginger snap recipes I've ever had!